Wealthy Living Radio Interview–Wealth Consciousness with Kim Evans–Must Listen! I would like to share with you a great call. I was a guest on Cheryl Broussard’s tele-radio show, “Wealthy Consciousness”. It has been recorded earlier and I like to share some inspirational tips with you. This is one of the most powerful shows I have done for the Wealthy Living Radio Show.. I share how I shifted my consciousness about my wealth and health with amazing results on debt management. Please have a notebook and be ready to jot down some power golden nuggets! Kim has clients all over the world…It’s a powerful and empowering message, please listen…. Happy Friday | Where is your Faith? February 7, 2014 by Ali Brown. A very good motivational read. In fact, I personally met Ali Brown a year ago in SF and have learned a great deal from her business model that has help my business grow tremendously. Please enjoy. Los Angeles, and carrying more than $30,000 in credit card debts. It was surely causing a lot of stress in our marriage. A friend of ours invited us to attend a “money mindset” seminar that sounded perfect for our situation. Although the event was free, it was still a big decision to take three days off, drive down to San Diego, and pay for a hotel. I remember driving home with G after that event, listening to him talking with a friend on his cell phone, and he sounded different—positive and confident, like the man I had originally married. It was so attractive! I felt different too. I was so excited for us to grow together, to have a bright future, to live together in this new positive mindset we’d found. I could barely sleep that evening. The next morning, I got out our workshop materials, and we continued the work we agreed to do each morning. The first week was no problem. Then, the next Monday morning G made some excuse, and the next day, and the next day, and that was the end of that. I kept doing them alone. I didn’t make a big deal out of it, and I let him be. But as I grew, both personally and financially, and began investing in my growth via trainings, workshops, and coaching, G became more stuck and frustrated. I tried everything… helping him with business ideas, getting us counseling, hiring him a coach, and more. What was the difference here? Was it really my attending seminars and getting the coaching and doing the personal work that made me successful, and not G? Well, no. Because you also see a lot of folks going to seminar after seminar and not getting results. Really the core difference was that I was learning to live in faith. It was truly my new OS (operating system), and still is today. While unpacking boxes with Brett at our new home in Scottsdale, I came across a great book a friend introduced me to years ago. It’s by Robert Russell, and it’s called God Works Through Faith. Faith is belief in what you cannot see and cannot understand. It’s belief in a power greater than you. And when you align with it, stay in faith, let it flow through you, and follow its messages, miracles happen. This doesn’t mean I don’t have my moments of worry, fear, or doubt. But the key is simply catching yourself when you go to that place. Take a deep breath and gently redirect your thoughts to what you want to happen, how you want to be, and how you see your life and business evolving. One of my favorite teachers on worry is Joyce Meyer. She says worry is negative prayer—it’s essentially praying for what you do NOT want. Worry is a huge problem for most of us, and especially for women. I come from a long line of worriers, and this is something I have to continually monitor and manage. If I don’t, it will just eat me alive. To shift it, I take a deep breath and move into gratitude… I think about all the wonderful things in my life right now such as my twin babies and their dad, our beautiful new home in the desert, having a business and clients I love, and the exciting opportunities I know are in front of me. That seems to get me in the right direction, and all the little things in the way seem to lose their power over me. There’s a lot more to it, but that’s what gets me started in the right direction. Because I found faith to be such a powerful part of what drives me and my success, I created a program called “Divine Success: The 7 Phases to Realizing Your Dreams”, which I think you’ll really enjoy. You can take a look at it here—it may be exactly what you need right now. 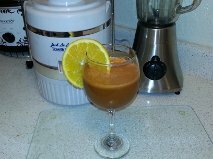 I would like to share with you one of my amazing super power juice drinks. 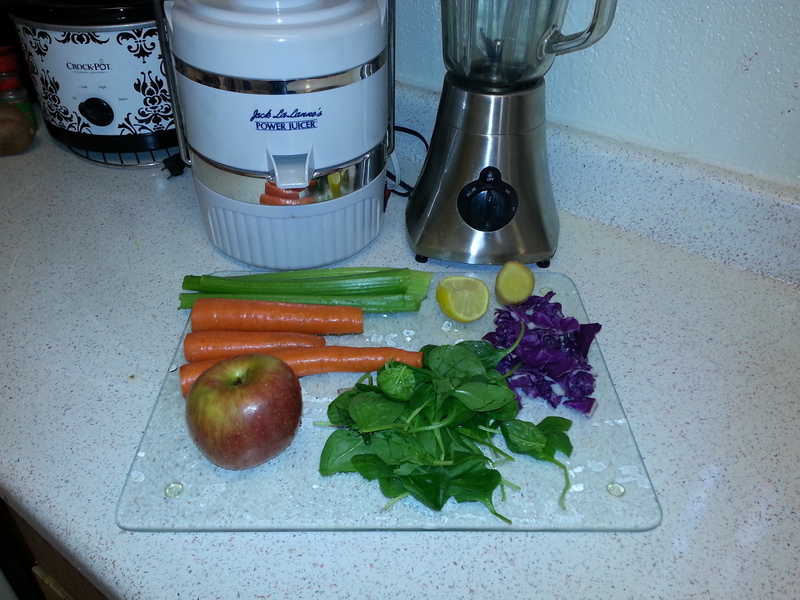 Many of you have been asking me some simple tips to juicing. Here is a simple and quick juice. It’s great for when you need a boost in energy, feeling sluggish, it helps to heighten your immunity and simply tastes fabulous. Juicer, ( I use the original Jack La Lanne’s, or use a Bullet). Fiber, Fat, & Protein in them to make them complete. 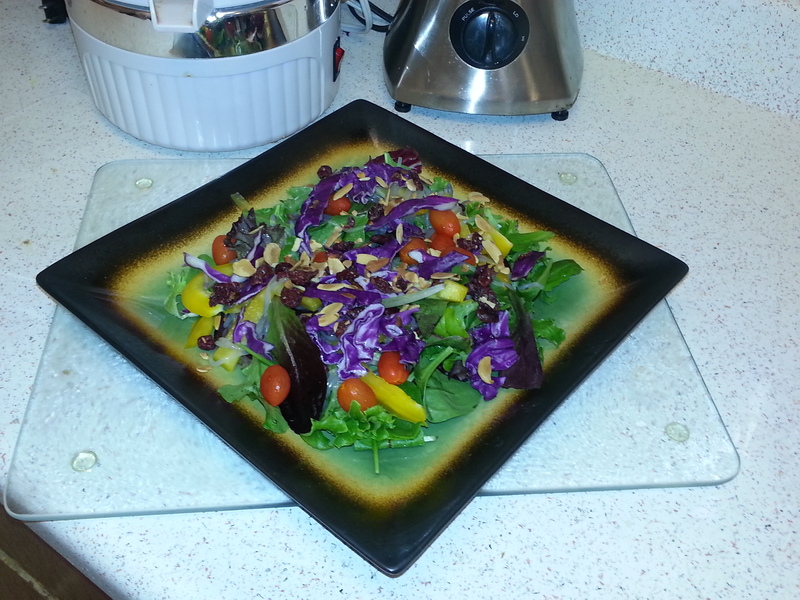 Add to your super power drink a well-balanced salad. Wash, chop and place all ingredients in a bowl then use your juicer. Serve in your favorite glass with a twist of orange or lemon. Spring is upon us, spring cleansing offers a great new start to get ourselves in order and Easter is near for a great spiritual reconnection celebration. What an awesome time to cleanse our bodies, start anew, refresh our minds and rejuvenate our spirits with clean eating that helps to enhance our bodies to become healthier, stronger and better. I would like to share with you this wonderful fabulous quick and easy recipe to jump-start you to better health and feeling great about your body for spring. Simple Homemade Healthy Chicken Vegetable Soup w/ Roasted Vegetables: all items can be purchased from your local supermarket or local Farmer’s Market. (1) Small Red Onion or Yellow. (1) Box Organic Chicken Broth, get at Trader Joe’s. Tools: In a Crock Pot, (great for the working person with limited time) or if you prefer use a ( 5 Quart Dutch oven or pot) over your stove top, (I will describe it here for slow crock pot cooking for the for simpler cooking). Get all your ingredients, cleanse, chop and cube all vegetables. Add to your slow crock pot before going to work. After you have cubed all your vegetables, roast vegetables before adding to your Crock pot by adding to a baking dish, season to taste with salt and seasonings and then drizzle with olive oil. Bake on 400 degrees for 45 minutes or 250 degrees for about two hours, slowly. When complete, you will add this mixture to your crock pot to finishing cooking. Season to taste chicken by using; (Turmeric, kosher salt or sea salt, black pepper, dill, cayenne pepper, poultry seasoning, cayenne pepper, rosemary, lemon pepper and tarragon). Preparing Initial Ingredients: Saute Garlic, onions, on a stove top in Olive Oil, then add to your crock pot. Add one box of Organic Chicken broth to crock pot over your chicken. Add garlic mixture. Next, after all your cubed vegetables are roasted in baking dish, add mixture along with chicken legs or breast to the crock pot, continue to season to taste. After all ingredients have been added, top with chopped Collard Greens or with one chopped cubed Zucchini. In final add to your crock pot mixture, cooked rice or uncooked egg noodles. You may prefer neither and simply enjoy all the wonderful taste of the vegetables alone. They will automatically cook along with remaining ingredients. Let simmer for four more hours and your meal is complete when you arrive from work. Make sure your Crock pot temperature is turned to “LOW”. Remember, optional add rice or noodles at the end. Top crock pot with any additional water if needed. Add: Cooked Rice or uncooked rice noodles at the end. Are you feeling a little chill and body pain? Do you feel that you may be coming down with the flu? Are you feeling a little achy? Has someone close to you recently been exposed to the flu? Are you feeling a little tired and low of energy? Are you suffering from congestion or post nasal drip? glorified cold from this season’s severe extreme cold weather. persist for any length of time always seek medical attention and call your doctor. Yes that is correct, take a hot bath. I know many love their showers; however in instances like this, a hot aromatherapy bath is best. Fill your tub with Lavender Epson salts. A better suggestion would be to bathe in natural sea salt with drops of Lavender essential oil. You would use a handful of salts and as the water is running add few drops of Lavender Essential oil and two drops of Peppermint essential oil. This is the best relaxation tonic for sore muscles, aches, pain and low energy, especially if you feel a chill or fever coming on. Go to the store and purchase one ginger root, a garlic clove, bag on lemons and an (optional extra tip), some lemongrass. Cut up thinly slices of ginger, little slices of garlic, (anti-viral), lemongrass combine altogether in clay tea pot with hot boiling water. Steep for about 7 to 8 minutes pour and add honey or plain and serve with lemon slices. Top the tea with a sprinkle of Cayenne pepper and drink all day. This is the best cold antiviral fighting tea you can ever drink. If you don’t like ginger because you may be experiencing IBS, or like the taste of ginger, then try Lemon Balm Leaf Tea. Purchase it fresh in the root herb form from a local health food store. You will wash, cut up the leaves and simply steep with hot boiling water in a clay tea pot. Steep for 7 to 9 minutes pour and add honey and lemon or simply drink it plain. You home will smell of fresh lemons and essence of lemon verbena, as you are brewing this powerful tea. this herb helps to encourage perspiration that helps rid the body of toxins. This is especially functional if you feel a cold coming on. This help can be taken in a tea or tincture form. This herb is made up of berries and flowers and is very tasty. in times like these it’s best to keep the body well hydrated with plenty of fluid. Cherry juice has many properties, but used here serves as a great anti-oxidant to help fight off invaders or (pathogens), which potentially can further harm the body defenses. This juice helps to strengthen the body defenses. There are several brands of this herb and it is often packaged with the herb Golden Seal. If your system can manage it, this would be a great dual option; otherwise, always drink Echinacea alone. Echinacea can be taken all year round and scientific research has shown this herb in fact can keep immune system healthy and strong. In a Natural News.com web article, stated that Echinacea extract works against an enzyme called hyaluronidase that destroys the body’s defenses against diseases. I had a client mentioned to me that they were feeling body pain and ask for an herbal remedy. I did a little research and came across this herb, which is an immune stimulant and has a long history of being effective in cases of influenza. It helps to diminish any coming on fever and aches. It also helps with congestion. Its antiviral properties help to dry out mucous and dry out digestive toxins. Ask any herbalist and they would highly recommend this herb, which is an ancient secret, as one of the best kept herbal remedies for treating the flu. Kim’s top favorite for immune support herbal remedy. This is by far my favorite dietary immune support tonic which helps to prevent infections, eye infections and colds all year round. Colloidal silver also helps to prevent and heal diminishing ill health. I take this every day to help build strong immune support, as a Massage Therapist, I am in contact with a lots of people and my number one priority is building and sustaining immune health. I highly recommend that you grab a bottle next time you are at your local health food store. Make sure that you purchase this brand, Sovereign Silver with the blue label. You will take about 5 to 10 droppersful under your tongue daily. Make sure that you read the bottle carefully. When you find a cold coming on you will take more and add a Vitamin A supplement. This will make l sure to turn your cold around in no time. Where can I find these products? This is a great question. Whole Foods, Harvest House, Trader Joe’ s (Cherry juice), Vitamin Shoppe or call me and I can order some of them for you. Where can I purchase my Aromatherapy bath salts? 2GORJS Custom Bath salts, shop our online store under salts. I will be happy to custom make some for you. How much do I take of each herb? Follow the manufacturer’s instructions on the bottle.